As our population ages, institutions worldwide are investing resources where they see the biggest return in quality of life: non-medical health interventions that augment traditional treatments. Many organizations support the Healer Within Foundation because our wellness interventions improve health where it’s needed most. Our goal is to empower the under-served to activate health and well‐being in their own lives, their family and community, thereby reducing public health costs. We do this by supporting those who reach out to these populations through existing service agencies, hospitals, low-income housing, and schools. Our approach is to provide these workers with knowledge and training to inform and inspire people who would otherwise not be exposed to these simple yet effective methods. Why the Tai Chi Easy™ Dissemination Project? Tai Chi is at the forefront of low-cost health interventions. Harvard University* is one of many institutions across the country that recognize the huge benefits of this simple method to participate in one’s own healing. Our Tai Chi Easy™ Dissemination Project gives every individual the tools they need take responsibility for their personal wellness. The result? Improved health in the target communities and reduced visits to the doctor, pharmacy and hospital! 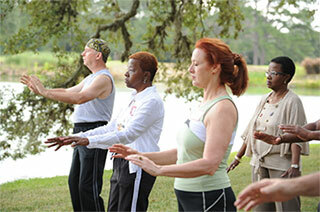 Tai Chi and Qigong are proven to prevent disease, reduce stress and accelerate healing*. 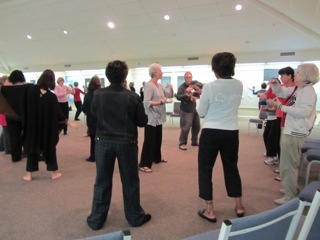 Tai Chi Easy™ is an internationally utilized program ‐ and it really is EASY! Be Part of the Next Big Shift in Health and Wellness! Everything is in place to expand our training nationwide. The Tai Chi Easy™ Program is fully developed. Its effectiveness is proven and the Nationwide Dissemination Program is field tested. We have training teams throughout key regions that are ready to implement Practice Leader Trainings. As funding becomes available, the program will easily scale to reach populations where benefits will be quickly experienced. How can Healer Within Foundation support your objectives? We welcome the opportunity to explore how our work can fit with your organization’s funding goals and mission. Together we can increase community wellness and reduce public health costs. Please contact us to begin a dialogue. "A growing body of carefully conducted research is building a compelling case for Tai Chi as an adjunct to standard medical treatment for the prevention and rehabilitation of many conditions commonly associated with age." Healer Within Foundation: a smart investment with a BIG health impact. Well-being for individuals, communities and institutions worldwide! The Healer Within Foundation is currently living out this mission through our Tai Chi Easy™ Dissemination Project. The project trains thousands of Practice Leaders who in turn spread the practice back in their communities where the need is the greatest. "After my home was foreclosed, I lost my car, home, and most of my belongings. I was so very down. My Tai Chi Easy™ Instructor, and the practices have helped me so much to release great stress and frustration. I so hope these classes can be offered to help others like me."